Home Affordable Refinance Program (HARP), a program launched by the federal government in the spring of 2009 to assist homeowners refinance who have lost equity in their homes and otherwise would either have to pay PMI (private mortgage insurance) or not be able to refinance at all if they were upside down (owe more on your home than its current value). We can help you with a Georgia HARP Loan or a Florida HARP Loan – Don’t wait any longer. Call or click today to get started on your HARP refinance. Your loan must be owned by Fannie Mae or Freddie Mac . This does guarantee that you are eligible, this is just one pre-requisite. Your current loan must have been closed and sold prior to 5/31/2009 to either Fannie Mae or Freddie Mac. Most people don’t necessarily know who “owns” their loan. The common perception is that the lender who they make their payments to is the one that owns their loan. Typically that is not the case. Most often, they lender that they close the loan with sells the loan shortly after you close and they would typically retain the servicing rights (collect your payments for a fee). Since Fannie Mae and Freddie Mac are the largest investors in the country, there is a good chance your loan is owned by one of these two. Click to see if Fannie Mae owns your loan. Click to see if Freddie Mac owns your loan. If your payment increases more than 20% (for example you wanted to refinance into a 15 year fixed from a 30 year fixed), then you will have to credit qualify. In addition, your credit score must be greater than 620 and the maximum debt to income ratio can’t exceed 45%. Expanded appraisal waivers so that in most cases, appraisals will not be necessary. Condominium project requirements have been relaxed to allow more of these people to be able to finally refinance. Mechanism will finally be in place to allow for people with mortgage insurance to finally be able to transfer the mortgage insurance certificate from one lender to another. Am I eligible for a HARP loan if I am behind on my mortgage payments? No you must be current on your payments. Will my home require an appraisal with the HARP program? An appraisal is not required when there is a reliable automated valuation model (AVM) value estimate on a property. If there is no reliable AVM estimate available, a new appraisal is necessary. The AVM is obtained once a complete application is in hand and the file is run through Fannie Mae or Freddie Mac’s automated system. 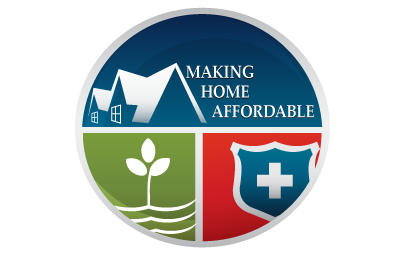 Is HARP the same thing as an FHA Streamline Refinance? No HARP is run through Fannie Mae or Freddie Mac. FHA loans are run through FHA and have different guidelines. Do I have to do a HARP refinance with my current mortgage lender? No you can do a HARP loan with any participating lender. So, I can use any mortgage lender for my HARP refinance? I do not currently pay mortgage insurance. If I no longer have the required equity to avoid paying mortgage insurance, will I be required to pay mortgage insurance through HARP? No that is the advantage of the HARP program, there is no requirement to pay PMI if you are not currently paying it. I pay PMI now. Will my PMI payments go up when I refinance under the new HARP program? No your mortgage insurance will stay the same. The insurance policy will need to be transferred from your old loan to the new one which will require an extra step. Can I combine my two (2) loans into one larger loan under HARP? No you can only refinance the current first mortgage. The second mortgage will have to stay in place. This is accomplished through a process called subordination whereby the second mortgage lender has to agree to it. They typically will charge a fee of $150-$300 depending on the lender but most of the lenders are aware of the HARP program and are going along with it. Most often, if you have a home equity line of credit, they will require you to modify the line amount down to your existing balance. Can I refinance a rental property or second home thru HARP? Are condominiums eligible under HARP? Yes, but the project still may have certain eligibility standards that heave to be met. Can I roll in my closing costs to into the new loan amount under the HARP program? Yes you can increase the loan amount by up to $5,000 to cover closing costs and also the cost of setting up a new tax and insurance escrow account if you so desire. You are not able to pull out any cash. Are the mortgage rates higher under HARP? No, rates for the HARP program will be similar to those you would receive in a traditional refinance.